The basic ingredients couldn’t be simpler—earth and water, plus a few mineral and vegetal dyes. But in the hands of a gifted artisan, guided and inspired by a long and rich tradition, these humble elements are transformed into stunning works of art possessing exceptional beauty and grace. 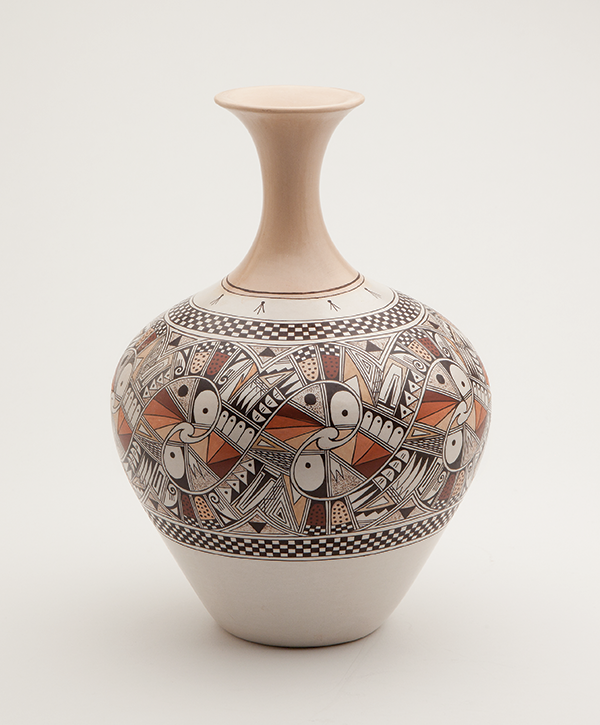 Elegance From Earth: Hopi Pottery told the story of the centuries-old Hopi pottery tradition. The exhibit was presented by Peabody Energy. Elegance From Earth explores the intertwined matriarchal artistic legacies of the Nampeyo, Naha and Navasie families. The Hopi-Tewa potter Nampeyo (c.1859-1942) was the first American Indian potter to be known and recognized by name. She revived a style of low-shouldered spherical jars based on those made at the village of Sikyatki in the 1600s, evolving detailed and complex designs inspired by Sikyatki pottery. In more recent times, her great-granddaughter Dextra Quotskuyva has received much recognition for her innovative designs and has taught some techniques to other family members, including her daughter Camille and her nephews Steve Lucas and Les Namingha. The exhibit also showcased the work of another great Hopi pottery matriarch, Paqua Naha (Frog Woman), who developed a distinctive style of white-slipped pottery with black and deep-red designs that was later adopted by her daughter Joy Navasie, who passed the tradition on to her children and grandchildren. Other significant makers represented include Helen Naha and her two daughters Rainy and Sylvia. Rainy Naha (Hopi-Tewa), "Parrot Union," 1999, ceramic. Gift of Roland and Ginny Wilson. 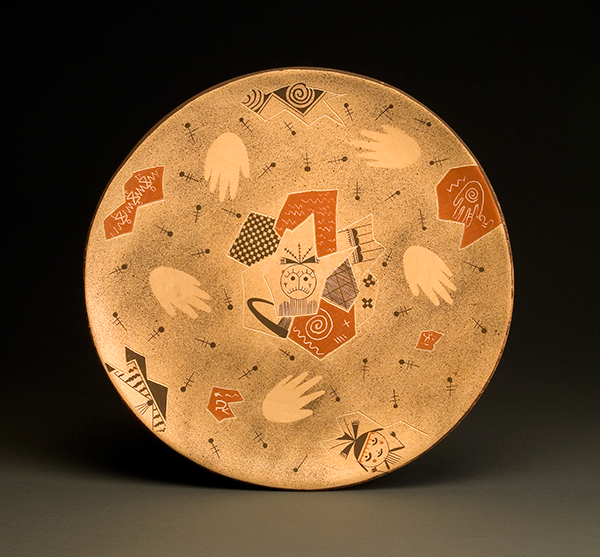 Jacob Koopee (Hopi/Tewa), Plate, 2000. Gift of Neil and Sarah Berman.